A new week means new comics! Here we go! The Avengers and the Infinity Gauntlet #3: Our heroes finally reach their destination: the asteroid from which Thanos is destroying the universe. Sadly, the fight doesn’t go so well. I like that they’ve taken a “the journey is more interesting than the destination” approach with this series; seeing Dr. Doom forced to make sandwiches is possibly one of the most satisfying things I’ve ever seen in a comic. However, I shouldn’t have read this book first, ’cause it made everything else seem way less awesome by comparison. Detective Comics #870: The “Impostors” story comes to a close here, and I have to say it’s been tremendously unsatisfying. Batman has been an ineffectual bystander, merely witnessing what’s going on and kind of shrugging and basically saying, “Well, what can ya do, amiright?” It’s also unsatisfying because this is a story with a theme – that Batman “created” the villains he fights, or that his very presence ensures that they keep coming back – that we’ve seen countless times. There’s nothing wrong with revisiting themes – when a character’s been around for 70+ years, it’s hard to break new ground without totally changing the character – but this wasn’t particularly done very well. And the villain’s motivation isn’t all that strong, to be honest. Justice League: Generation Lost #12: The fight between Fire and an enraged, superpowerful Ice is intercut with a revised look at Ice’s origin. It’s a nice breather issue, giving us a look at who Ice is and how her childhood has shaped her approach to the use of her powers…and why making her upset or angry is probably a really bad idea. We’re now at the halfway point of this series, and it’s looking pretty good so far. Wonder Woman #604: So we finally get to meet the villain of the piece – well, one of the villains of the piece – and he’s…pretty unmemorable. I mean, Burn Victim Man (as I like to think of him) seems pretty generic and not at all unique in terms of his motivation or characterization. I’m still not sure why this is a story that required we completely change the circumstances of the character, and I’d really rather be reading Gail Simone’s Wonder Woman instead. Action Comics #894: The much-heralded return of Neil Gaiman’s Death (of Sandman fame) to the DC Universe proper turned out to be…well, pretty darn good, honestly. For an issue that’s really just two people standing around talking about death and dying in comics, it’s entertaining and visually interesting. Cornell gets in some absolutely great lines (“A pony. A magic pony. A magic pony that sings.”), and Woods draws the hell out of Death and Luthor’s debate. And the Jimmy Olsen backup continues to be absolutely fantastic as well, featuring aliens who basically get drunk on oxygen. Good times. I also grabbed the Hellboy: Masks and Monsters trade. It features the Hellboy/Batman/Starman team-up from 1999 drawn by Mignola and a team-up between Hellboy and a character called the Ghost from the mid-90s. Both seem pretty solid, though I am left wondering (in the first story, at any rate) whether there was any reason to have Hellboy there other than someone thinking, “Hey, wouldn’t it be awesome if we had Hellboy and Batman running around Gotham beating up Nazis?” And honestly, there isn’t anything about that last sentence that isn’t awesome. It’s time once again for the internet’s laziest, least-interesting comics review! Get excited! Green Hornet: Year One #6: Part of me wants to stop getting this book in single issues, ’cause it’s clearly going to read much better in a big trade-sized chunk. It’s not that it’s a bad book, mind, just that reading it issue by issue kills the momentum of the story. We finally get to see the Green Hornet piece together his modus operandi and take on some thugs on a moving train. The art is good, though there are some storytelling problems during the train scene that make it hard to follow the action and tell who ends up where and how. Deadpool #28: So the villain of this particular storyline is “Doctor Bong?” And he’s got a bell for a head? That’s just downright weird. The story is good, though, as the real Secret Avengers show up and lots of fighting ensues. Chaos War #2: The Chaos King invades the afterlife, anyone who isn’t a god gets put into a magical comatose state, and the all-new God Squad is gathered. This issue doesn’t move with quite the same fantastic pacing that most Pak/Van Lente joints have, but it’s clearly just setting the stage for the awesome things to come. I do have a complaint about Khoi Pham’s art: everything looks kinda plastic. Like, the people do. I dunno if it’s the inker or the colorist or Pham himself or what, but it’s distracting. Batman and Robin #15: The reveal on the final page of this issue was awesome. And, despite my usual misgivings about Frazer Irving’s art, he really knocked it outta the park on this issue. Everything is finally coming together, and the final showdown between Batman and Dr. Hurt is nigh. Will we finally figure out just who the hell Dr. Hurt is? Or is this just gonna be one of those bits that gets left dangling for ever until someone else comes along and tries to explain it away as a clone of Thomas Wayne or something equally ridiculous? Who knows. I also picked up a couple of trades this week: Final Crisis: Legion of 3 Worlds, which seemed like an excuse to have George Perez draw the hell out of as many members of the Legion of Super-Heroes as possible (not that I’m complaining) and may’ve finally removed Superboy-Prime from the gameboard as a character we ever have to see in anything ever again. I also grabbed the latest volume of X-Factor, which was pretty cool and featured a great story involving the Fantastic Four (also, I would buy the hell out of a series featuring Ben Grimm, Shatterstar, and Monet running around cold wreckin’ stuff. It would be beyond amazing). 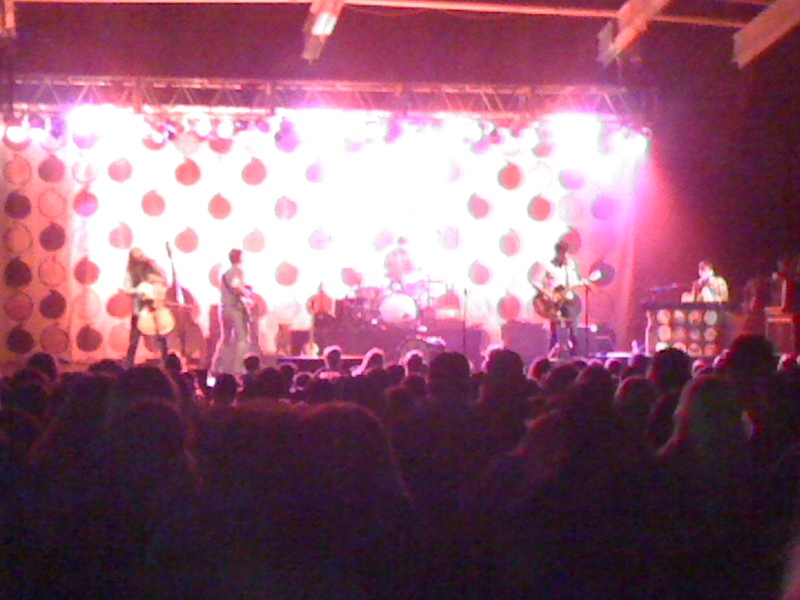 On Saturday, October 16th, I saw the Avett Brothers at Pier 6 in Baltimore, Maryland. They put on a hell of a show, even if I do find it bizarre that what is essentially an old-timey string band has become as popular as these guys have (seriously, there were way too many douchey frat guys at this thing. Way too many). That aside, they are very entertaining, and their live show is full of energy and humor. The guitar player spends most of the show running in place for some reason, the banjo player keeps hopping back and forth between the banjo and the piano, and the cellist carries his cello around while playing. Songs that felt rather staid and flat on studio recordings come alive in this setting. The guys in the band are all energetic and clearly love what they’re doing, though I sometimes wonder how they manage to keep singing night after night (what with all the shout-singing they seem to do). These guys can holler, let me tell you. The band’s following is clearly just as passionate and energetic as the band themselves are. People were singing along, dancing, and jumping around as though this were the greatest event in their lives. It would’ve been hard not to have a good time, honestly, even if this wasn’t a type of music you’re particularly in to. On top of all that, they had Grace Potter and the Nocturnals open for them, and those folks can put on a hell of a show, too. They struck me as sort of a CCR fronted by a Janis Joplin type, and that’s something I can really get behind. All in all, the show was really quite good. The only downside was the venue. The Pier 6 Concert Pavilion is an outdoor tent-type thing (which is fine in and of itself), but the organization and security presence at the show seemed poor at best. My friend used the ATM and didn’t receive her money out of it, there were almost no venue personnel around, leaving everyone to find their seats by themselves and leaving no one to enforce the rules (such as the no smoking rule which everyone around me seemed to ignore). I don’t think I’d want to see another show at that venue, honestly. But hey, it was a damn good concert anyway. Back to buying my comics week by week. This is the Pull List: get excited! Batman: The Return of Bruce Wayne #5: As Bruce gets closer and closer to the present, things get stranger and stranger. Here, he’s pulled into a murder investigation…for his own parents. Everything that Grant Morrison’s been doing for the past several years with Batman – the Black Glove, the Club of Heroes – is all coming to a point here. Ryan Sook’s art is fantastic and a perfect fit to the moody, noir-ish plot for this issue. Good stuff. Booster Gold #37: There’s a brilliant moment here – when Booster hops a little into the future (but still in the old JLI days) to ask Ted Kord how he survived an incident – and it’s absolutely perfect. The plot for this book may be kinda thin, what with all the deviations from it and asides and tangents and all, but it’s a fun book, which is what it should be. Justice League: Generation Lost #11: Ice, Fire, and Rocket Red versus the alloyed Metal Men! And Tora’s got an icy mad on goin’. Meanwhile, Booster, Blue Beetle, and Captain Atom run around trying to uncover more of Maxwell Lord’s plot, only to run into a factory they certainly weren’t expecting. This book’s finally starting to click for me. Knight and Squire #1: This book is unabashedly British through and through. There’s everything from rhyming slang to a team of heroes based on cricket players (it somehow never caught on in the US). Paul Cornell’s story is pretty light – about a pub that’s neutral ground between heroes and villains – but the book itself is a delight. Casanova #4: Casanova finally puts on the big boy pants and proves himself to be…well, if not exactly a hero, at least a protagonist we’re gonna root for. Cross and double-cross abound in this issue, the final installment of the first storyline. Good times. Invincible Iron Man #31: If you can’t bring Mohammad to the mountain, bring the mountain to Mohammad. That’s Tony Stark’s idea after a tech conference he was going to present his car of the future at gets canceled (because of his planned attendance, natch). But things go from bad to worse when the Hammer family decides to strike at Stark’s own exhibition. Thor #616: Yeah, I bought three Matt Fraction books this week. This seems a little like a retread of issue 615, with a human scientist trying to explain to yet another Asgardian (this time, Thor) his theory about nature abhorring a vacuum. Thor seems uncharacteristically angry with the human, and it struck me as a bit odd. I mean, sure, the guy’s home just got destroyed in the Siege and all, but threatening a human with his hammer just ’cause the human tried to explain something that’ll be important to him? Weird. And that last page…stranger still. Welcome to Tranquility: One Foot in the Grave #4: When you’re going up against one of the most powerful – and psychopathic – beings on the planet, you gotta bring the right people along. Someone who’s already dead and can’t get much deader? Probably a good idea. Even though it turns out not to be. Simone keeps ratcheting up the creepy factor in this book, and it’s pretty awesome. I do miss Googe’s artwork, though. I also grabbed the last trade of Gail Simone’s Wonder Woman run. Honestly, I think time will bear out that Simone’s run on Wonder Woman was easily one of the best the title’s ever seen (the same will not be said for JMS’s run, I don’t think). Hey, I finally added some extra storage space to the blog, meaning I can now post audio files. So yeah, have some music. This first song is one I wrote and recorded myself (with the exception of the guitar solo, which was conceived and played by one of my students at school). I’m pretty damn pleased with how the song turned out; all I really need is some drums (and possibly the ability to play said drums. But that goes without saying, I think, even if I did just say it). Anyway, enjoy the song, and let me know what you think. I’ll be adding more and probably creating a specific Music Page here pretty soon. Let’s see what the first week of October had to offer, shall we? Batman: Odyssey #4: Batman wigs out when he thinks a little girl’s been killed and goes to town on the guy who did it. How many times have we seen the “Batman snaps and nearly kills a guy only to be talked down” thing? Also, since when do EMTs and the police and the freakin’ Batman all just assume a person’s dead without checking for vital signs? Kind of an epic fail here, Neal Adams. Chaos War #1: The Lion of Olympus is back, but all is not well. There’s danger a-comin’, in the form of the Chaos King (our good buddy Mikaboshi, who just happened to not return to Earth with the rest of the God Squad at the end of Sacred Invasion). Herc has to convince everyone he’s not crazy and that there is danger, which is no easy task. Good thing he’s got Amadeus Cho on his side. Doom Patrol #15: It’s the Patrol versus the Chief! And the Chief is increasingly unbalanced, it seems, ’cause trying to graft Kryptonian DNA onto your own just isn’t a good idea. Plus, there’s that fantastic intro with Ambush Bug. I kinda want all comics to recap the plot like that. S.H.I.E.L.D. #4: Things are getting even crazier, what with da Vinci birthing something in the heart of the sun (and let’s not even get into how he’s surviving being in the sun), Leonid getting a deeper look at his own role in things, and a not-quite-a-confrontation between da Vinci and Newton. Also, Nostradamus, who has some serious emotional problems after letting himself be locked up for several centuries. Interesting stuff and fantastic art as always. Secret Six #26: Bane is not someone you mess with. At all. Skartaris doesn’t stand a chance, unless Scandal Savage’s Six can stop him. This comic, month in and month out, is one of my favorite reads. Simone delivers again! In terms of trades, I grabbed the third Secret Six trade, Danse Macabre, which was quite solid (especially for a Blackest Night tie-in). Definitely some good stuff this week. Man, getting through September without getting to read comics was tough! I did it, though, and ended up picking up all my September stuff the first week of October, so that wasn’t so bad. Let’s see what we missed, shall we? Hercules: Twilight of a God #4: The finale to this miniseries gives the Prince of Power a right proper sendoff, letting him go head to head with a blackhole and, well, winning (even if he does give his life for it). Great art, solid if not particularly original story, and just a fun little ride all around. Secret Six #25: Holy crap, Gail Simone is just downright evil. Catman attempting suicide by lion is pretty awesome, though, and the promise of Six vs. Six from this issue is gonna rule. Batman and Robin #14: This issue was downright creepy. I kinda knew what to expect going in, what with having seen the preview and read reviews and such, but it was still a damn well done issue. I’m not a huge fan of Frazer Irving’s art, but Grant Morrison’s story is dead on. In the hands of a lesser team, Professor Pyg would just be ridiculous, but Morrison (and Irving, I have to admit) have me downright terrified of the guy. He ain’t right in the head. Batman: Odyssey #3: I just…I don’t really know how to feel about this title. Sure, it’s Neal Adams and it’s Batman, but…it just doesn’t feel right. Everything is very over the top, everything is very exaggerated, and that’s fine and all, but…I dunno. The story’s a mess, the art’s not up to his usual high standard, and everyone…talks…like this! Booster Gold #36: This title continues to be awesome. The cover is frankly fantastic, and the continued antics of Booster in the JLI days is hysterical. Also, I realize now I miss Ted Kord, even though I wasn’t really reading comics when he was still alive. Sad, really. Doom Patrol #14: So the Chief just decided to keep a Kryptonian around to do experiments on? And now he’s all superpowered and crazy? Okay, sounds like a wild ride. I’m in. Giffen continues to make this a hell of a book. Green Hornet: Year One #5: I don’t think I’d really realized it before now, but apparently this title isn’t a miniseries, it’s an ongoing. Which is awesome. Matt Wagner does period stories better than just about anyone, and seeing the young Britt Reid coming to terms with his place in the world and realizing the limits of working within the law to bring evil to justice…it’s great. Invincible Iron Man #30: Tony Stark has a confrontation, a couple of cars blow up, and Pepper Potts comes to the rescue. Is there anything about this book that isn’t great? Well, I could probably do with a different artist, though Larroca’s art is far from terrible (just not terribly interesting to me). Justice League: Generation Lost #9: I was skeptical when I saw that Judd Winick was running the show solo now, but it’s going pretty well, I think. We get more infighting among our heroes, Maxwell Lord hints at his plans and goals, and it’s just an interesting book still. Welcome to Tranquility: One Foot in the Grave #4: I have mentioned Gail Simone is evil, right? ‘Cause she ups the ante here, pitting the villain of the piece against everyone’s favorite aviatrix, and that fork featured on the cover? It ain’t there just to look cool. Avengers & the Infinity Gauntlet #2: So we’re already halfway through this miniseries and they’ve only just left Earth and filled up their space rig with gas. They’ve got two issues to defeat Thanos and save the universe. Sure, I think that they’ll do it, and I’d be willing to read an ongoing series by Clevinger about Spider-Man and Doom bantering back and forth, but I fear the ending of this is gonna be kinda rushed. We’ll see. Birds of Prey #5: Black Canary is in deep trouble. So deep, that her friends are probably gonna regret trying to help her out of it. Things get worse for the Birds in the aftermath of the first arc, and Simone keeps things moving so quickly here that it’s almost disjointed and scattered (which I kinda think she did on purpose to leave the reader feeling off-balance, just as the characters feel). I find it interesting that Ed Benes already needs a fill-in artist. Let’s just go ahead and put Nicola Scott on this book and be done with it. Deadpool #27: Steve Rogers sucker punches Deadpool. ‘Nuff said. Joe the Barbarian #7: Joe’s grasp of what is and isn’t real is as tenuous as ever, though that may be because what is and isn’t real isn’t staying the same. This book is still pure, distilled awesome, from Morrison’s writing to Sean Murphy’s art to Dave Stewart’s colors and Todd Klein’s letters. This is like a comics dream team here, folks. Astonishing X-Men: Xenogenesis #3: A face-off between the X-Men and a ruler who will do what it takes to protect his country, the use of a decades-old plot device from Excalibur, and the usual no-good-choices scenario that Warren Ellis writes so well…it’s a decent comic, and I’m kinda glad I’ve stuck with the series. The Flash #5: The plot thickens as we discover that villains turned allies probably aren’t as friendly as we thought. Things go from bad to worse for the Flash, and look like they’re not going to improve anytime soon. Love the art in this book, too, even if Barry Allen is still something of a cipher. Justice League: Generation Lost #10: Can I just say that Cliff Chiang’s cover for this book is absolutely perfect? Admittedly, all of his covers for the series have been great, but there’s just something about this cover in particular that really grabs me (it’s probably Batman). Thor #615: Matt Fraction comes on board to write with this issue, and it’s pretty great. I love the basic concept – that if you leave a space empty, something else will just fill it up – and the art is great. There’s a cartoony feeling to it that I love and much prefer to the hyper-realistic art that seems to be more of Marvel’s house style lately. Action Comics #893: Lex Luthor vs. Gorilla Grodd. Lexbots. This book continues to be pure awesome. And the Jimmy Olsen co-feature is perfect. I would read the hell out of a Nick Spencer Jimmy Olsen ongoing. Get on that, DC! Atlas #5: I’m really sad that this is the last issue of Atlas. I was digging the title. I do like that it’s open-ended enough for the team to return down the road, maybe, but it still annoys me that this book basically gets killed off right as it’s finding its momentum each time. That said, it’s a pretty great sendoff for the team; everyone gets their moment to shine, the good guys win (of course), and there’s a nice little moment between Jimmy Woo and the spirit of his former enemy/mentor, Master Plan, that’s pretty great. Also, we should totally get a Ken Hale ongoing, because he is the single greatest monkey ever. Casanova #3: Things get real funky here with an island of superintelligent cavemen and Casanova starting to realize he needs to grow up and grow a pair. Why have I not read this book before now? Detective Comics #869: This story continues to irritate me. It’s implied that this is the Bruce Wayne Batman, but if so, he’s the most ineffectual we’ve ever seen him. Batman basically sits around shrugging the whole time, saying, “Well, what the hell can I do about all these impostor Jokers and impostor Batmen running around?” Then he kicks his feet up on the Bat Computer and eats a bag of chips. Lazy, useless Batman is not Batman. The art is still pretty great, though. Wonder Woman #603: JMS’s take on Wonder Woman continues to do a whole lot of nothin’ for me. I mean, I’m still not even sure what the point of it all was. Why change her history? Why change her situation the way he has? It hasn’t really added anything to the story. This could’ve been done with the star-spangled shorts and tiara just as easily as the useless jacket and stretch pants. We’ve really gained nothing with these changes except for some publicity (which was probably the point) and some exasperation. Mostly the latter. What with finally getting a paycheck this week, I was able to go and pick up all of last month’s comics. I’m still working my way through them all, so hopefully tomorrow or the next day I’ll have my thoughts on them. So far, though, I will say this: I read way too damn many comics, I think. It’s a huge stack. I’ve been working on them since Thursday night, and I still have three or four left to read. In other news, I have tomorrow off, thanks to a drunkard who thought he’d reached a completely different continent a few hundred years ago. Way to go, Columbus. Your inability to figure out geography means I don’t have to work on tomorrow. The long month of having no money is finally coming to an end. We got a rent check from my sister-in-law, which definitely gets us through until payday on Tuesday. So to celebrate, the wife and I each bought a new book: she grabbed the third book in The Hunger Games trilogy, and I grabbed the latest Terry Pratchett novel, I Shall Wear Midnight. I’m a huge fan of Pratchett and his Discworld novels. The Tiffany Aching novels have been a bit hit and miss (Wee Free Men and A Hatful of Sky were both great, though I felt a little let down by Wintersmith), as was the last adult Discworld novel, Unseen Academicals, but this particular entry in the series (the last Tiffany Aching novel, apparently) is great. Whereas Academicals suffered from a lack of clear purpose or much of the trademark humor that Pratchett’s novels usually possess, I Shall Wear Midnight is witty, clever, and well-plotted. There are plenty of returning characters – including a nice bit with Eskarina Smith, the young woman who became a wizard back in the early Discworld novel Equal Rites – and a couple of new characters, including the guard Preston who is much smarter than he seems, an overbearing Duchess, and her daughter Letitia (who, at the point where I am in the book, is on her way to becoming sympathetic). It’s nice to see Tiffany getting to grow as a character and even making mistakes. All too often in novels, the protagonist never makes mistakes, doesn’t do things for petty reasons, and is able to easily solve their problems. That ain’t the case with Tiffany; she’s a 16 year old girl, and she behaves like one (albeit a rather intelligent one). This means she sometimes does things because she is angry, tired, or frustrated. I don’t want to give away what happens in the book, but it involves a being called the Cunning Man who has a mad on for witches in general and Tiffany in particular. Being as Tiffany is a witch, she has to figure out (on her own) how to deal with this. I’m about 2/3 of the way through the book, and it feels like classic Pratchett. Definitely recommended.